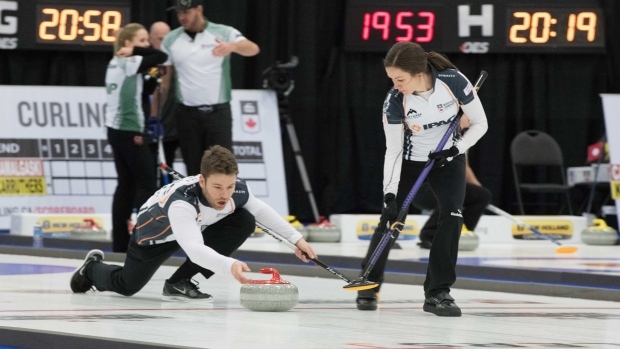 FREDERICTON — Defending champions Laura Walker and Kirk Muyres are moving on at the Canadian mixed doubles curling championship. Walker and Muyres downed Bobbi Sauder and Brendan Bottcher 9-3 on Saturday evening in quarterfinal action to reach the final four of what started as a 32-team event. Jocelyn Peterman and Brett Gallant downed Jolene Campbell and John Morris 9-1 to earn their spot against the 2018 winners in Sunday morning's semifinals. The second semifinal will see Kadriana Sahaidak and Colton Lott against Nancy Martin and Tyrell Griffith. Sahaidak and Lott toppled Dezaray Hawes and Tyler Tardi 7-4, while Martin and Griffith beat Shannon Birchard and Catlin Schneider 7-6 in the other quarterfinal draws. Both semifinals are Sunday morning, with the championship draw scheduled for the afternoon.